Traditionally used by Europeans to treat a variety of illnesses with its antioxidant and anti-microbial properties. Usually served best with cold dishes. 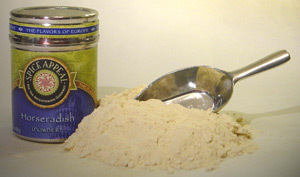 Mix 1 ½ parts water with 1 part horseradish powder. When mixed with ketchup, becomes a tangy cocktail sauce or dip for seafood such as shrimp and oysters. Used in prepared mustards, relishes, salad dressings, meats and seafood for that extra zest.